Lawyers wait for the verdict that never came on Thursday. 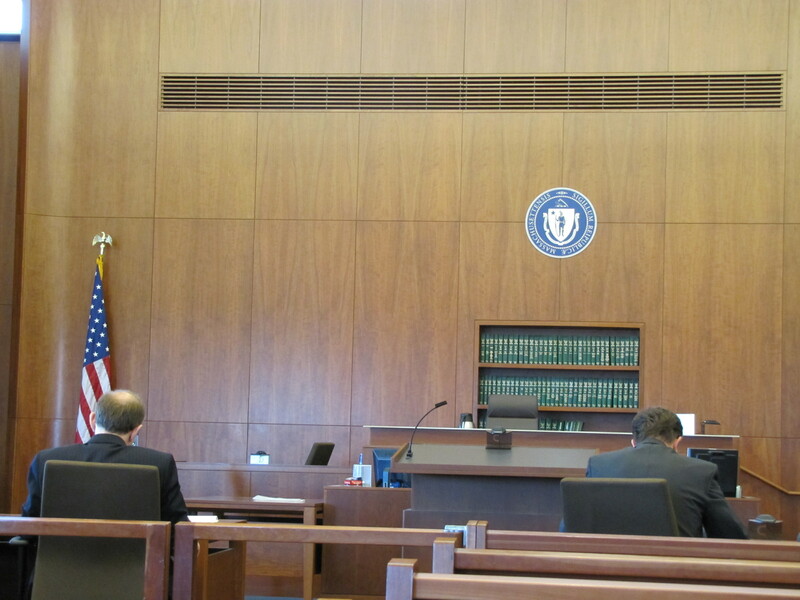 PLYMOUTH, Mass.– The brilliant blue waters of Cape Cod Bay were visible from the courtroom windows, but jurors remained hidden behind closed doors Thursday as they deliberated eight verdicts in the April 2003 Buzzards Bay oil spill case. Attorneys and a handful of SouthCoast residents waited seven hours in the Plymouth Trial Court building. They passed the time talking, working on their laptops and taking in views of the bay offered by the third-floor windows. At 4 p.m., it appeared the jury had rendered a verdict, and the lawyers took their places in the courtroom. Then, the clerk announced that the jury had requested additional time Friday morning to deliberate the case. Afterward, a lawyer joked that given the date, the false appearance of a verdict must have been an April Fool’s Day prank. Thursday marked the ninth day of civil proceedings in a class-action lawsuit involving eight Mattapoisett property owners who are seeking damages from Bouchard due to oil contamination from the Bouchard 120 oil spill. The eight plaintiffs are part of a 1,100-member class who filed the lawsuit against Bouchard in September 2004. The jury must make eight verdicts involving 11 properties. They must decide how much, if any, in damages Bouchard owes the eight plaintiffs. Outside the courtroom, Kim and Joseph DeLeo of Mattapoisett appeared content to return to the courthouse Friday. “We waited seven years, what’s a couple days more?” Mr. DeLeo said. Jurors will return to court Friday at 9 a.m.